Su Negocio, a free financial education program was provided to Chicago Latino small business owners to help them launch a new commercial enterprise or expand their existing business operations. 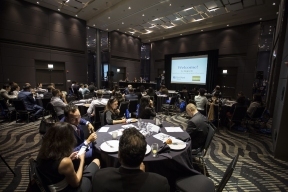 The Chicago business community learned about all available business resources, including legal services, mentorship programs, financial education, and funding resources at the Hard Rock hotel in Chicago. Raising capital was one of several topics discussed during the Su Negocio event for Hispanic entrepreneurs. About 60 people attended the panel discussion and educational sessions hosted by MassMutual, the Hispanic National Bar Association and the small-business mentoring program SCORE. A survey by HawkPartners for MassMutual in early 2015 found some 80 percent of Latino business owners planned to pass their business to a family member. However, 37 percent said the chosen successor may not know he or she is to inherit the business. Latino-owned small businesses are the fastest growing segment of small businesses in the country. MassMutual, HNBA and SCORE will come together to provide Latinos with free access to resources to either help start or expand a commercial enterprise, and help protect their businesses for a successful future. Chicago is the third stop on a 5-city tour throughout 2016. Upcoming events include San Jose (Aug. 3) and New York (Fall 2016). For more information related to access to capital visit www.scorechicago.org or www.massmutual.com/latino.